Ageing is multi-factorial which reflects at cellular, organ and organism levels. Through advancements in modern medicine and technology more humans are surviving into later life with the potential to reach their technical life span of approximately 120 years of age. However, part of the disability currently seen  in the elderly is due to lifestyle-induced diseases (for example, smoking related to heart disease and stroke). The elderly have a distinct spectrum of diseases which includes stroke, hypertension, coronary heart diseases, parkinsonism, osteoporosis, osteoarthritis, constipation, urinary incontinence, insomnia, vertigo, deafness and dementia including Alzheimer's disease (AD). Dementia is a chronic disorder in which there is progressive decline in intellect, behavior and personality. Certain conditions such as AD, multi infarct dementia, uremia, chronic hepatic encephalopathy, thyroid/adrenal dysfunction, pernicious anemia, pellagra, brain tumors, subdural hematoma and head injury may cause dementia. Among these conditions, AD is being projected as one of the important memory disorder which calls for proper management. The classic triad of senile plaques, neurofibrillary tangles and granulovascular degeneration are suggested to be pathogenic of AD. Clinical features include memory loss, difficulty in learning and retaining new information, depressive symptoms, aggression, agitation and disorders of perception. Keeping the above in view, a careful review has been done about the herbal recipes suggested by Ayurvedic classics in the management of disease called Vātavyādhi (nervous system disorders). In addition to the above diseased condition an analysis has also been carried out about the memory enhancing drugs categorized under Medhya Rasāyana (memory rejuvenators) group of drugs. 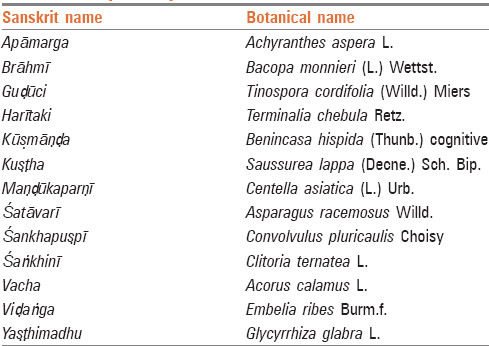 Herbs indicated in the treatment of Vātavyādhi (nervous system disorders)  which may help in restoration of declining memory are listed in [Table 2]. 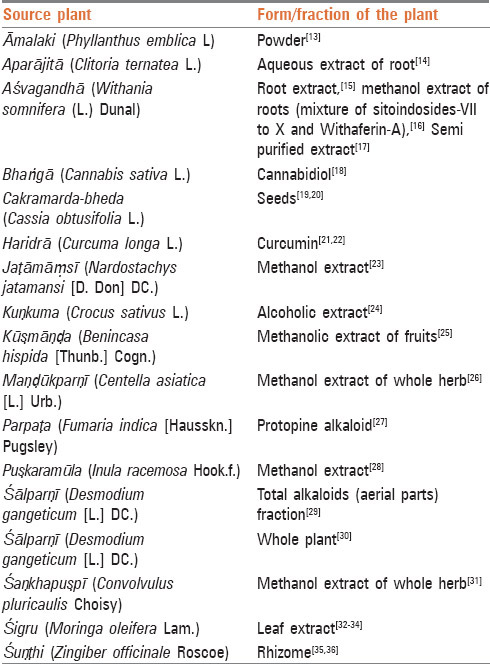 Certain medicinal plants and their combinations mentioned in Ayurvedic material medica have been evaluated in various experimental studies for their memory enhancing property are enumerated in [Table 3]. From the above list, the herbs which were subjected to extensive evaluation for their activity in the management of dementia are summarized below. ācaryas of Ayurveda opine that Jarā (senility) is a natural disease (Svābhāvika vyādhi). Premature senility can be well-prevented by regular intake of Rasāyana or Vayassthāpana (longevity promoter) drugs. It is suggested to introduce Rasāyana drugs during young and middle phases of life. Ayurvedic classics document the decade wise decline in individuals and emphasized further that the decline of intelligence and memory starts at the end of 40 th year of the life. Dementia pathologies such as AD are reaching epidemic proportions. They are not being successfully managed effectively by symptomatic treatments. Currently, two centrally acting, reversible anti-cholinesterase drugs, tacrine and donepezil, are used to increase acetylcholine levels in the brain. Beneficial effects of the drugs are most notable in the early stages of the disease and lessen as the disease progresses. There are many herbs from ethno-medicinal source which have been studied for their experimental potential in treating AD. A judicious combination of Ayurvedic methodology along with proved herbs from varied origin can be used in a in the management of AD. Schernitski P, Bootman JL, Byers J, Likes K, Hughes JH. Demographic characteristics of elderly drug overdose patients admitted to a hospital emergency department. J Am Geriatr Soc 1980;28:544-6. Nelson RC, Franzi LR, Nutrition and ageing, Geriatric medicine. In: The Medical Clinics of North America. Vol. 73. W.B. Saunders company, Philadelphia; 1989. p. 1531. Katzman R. Editorial: The prevalence and malignancy of Alzheimer disease. A major killer. Arch Neurol 1976;33:217-8. Terry RD, Davies P. Dementia of the Alzheimer type. Annu Rev Neurosci 1980;3:77-95. Golwalla AF. Medicine for Students. Mumbai: The National Book Depot; 2003. Germaine Louise Odenheimer Acquired cognitivedisorders of the elderly, Geriatricmedicine. In: The Medical Clinics of North America.Vol.73. W. B. Saunders company, 1989. p. 1405. Upadhyaya Y. In: Nidan M, editor. Jararoga nidan 37/116. Varanasi: Chaukhambha Sanskrit Sansthan; 1993. p. 500-1. Agnivesa. In: Acharya VJ, editor. 'Charak Samhita', revised by Charak and Dradhabala with 'Ayurved Dipika' commented by Chakrapanidatta. Cha.Sha. 1/101. Goapal Mandir Lane, Varanasi, India: Chaukhambha Surbharti Prakashan; 2005. p. 297. Chaudhuri K, Samarakoon SM, Chandola HM, Kumar R, Ravishankar B. Evaluation of diet and life style in etiopathogenesis of senile dementia: A survey study. Ayu 2011;32:171-6. Bhavmishra. Bhavprakasha Samhita edited with 'Vidyotini' Hindi comm. by Brahmasankara Mishra and Rupalalji Vaisya, Part II, Rasayana. Varanasi: Chaukhambha Sanskrit Bhawan; 2010;822-23. Bhavmishra. Bhavprakasha Samhita edited with 'Vidyotini' Hindi comm. by Brahmasankara Mishra and Rupalalji Vaisya, Part II, Vatavyadhi. Varanasi: Chaukhambha Sanskrit Bhawan; 2010;227-72. Datta C. Chakradatta of Chakrapani Datta, with 'Padarhtabodhini' Hindi Comm. By Vd. Ravidatta Sastri, Apasmaradhikar 21/11. Reprint. Varanasi: Chaukhambha Surbharti Prakashan; 2006. p. 90. Vasudevan M, Parle M. Memory enhancing activity of Anwala churna (Emblica officinalis Gaertn. ): An Ayurvedic preparation. Physiol Behav 2007;91:46-54. RaiKiranmai S. Neurogenic potential of Clitoriaternatea aqueous root extract - A basis for enhancing learning and memory, World academy of science, Engineering and technology 2010;4;10-22. Dhuley JN. Nootropic-like effect of ashwagandha (Withania somnifera L.) in mice. Phytother Res 2001;15:524-8. Schliebs R, Liebmann A, Bhattacharya SK, Kumar A, Ghosal S, Bigl V. Systemic administration of defined extracts from Withania somnifera (Indian Ginseng) and Shilajit differentially affects cholinergic but not glutamatergic and GABAergic markers in rat brain. Neurochem Int 1997;30:181-90. Sehgal N, Gupta A, Valli RK, Joshi SD, Mills JT, Hamel E, et al. Withania somnifera reverses Alzheimer's disease pathology by enhancing low-density lipoprotein receptor-related protein in liver. Proc Natl Acad Sci U S A 2012;109:3510-5. Dev S. A Selection of Prime Ayurvedic Plant Drugs-Ancient-Modern Concordance. New Delhi: Anamaya Publishers; 2006. p. 137. Drever BD, Anderson WG, Riedel G, Kim DH, Ryu JH, Choi DY, et al. The seed extract of Cassia obtusifolia offers neuroprotection to mouse hippocampal cultures. J Pharmacol Sci 2008;107:380-92. Kim DH, Yoon BH, Kim YW, Lee S, Shin BY, Jung JW, et al. The seed extract of Cassia obtusifolia ameliorates learning and memory impairments induced by scopolamine or transient cerebral hypoperfusion in mice. J Pharmacol Sci 2007;105:82-93. Zhou H, Beevers CS, Huang S. The targets of curcumin. Curr Drug Targets 2011;12:332-47. Lin MS, Hung KS, Chiu WT, Sun YY, Tsai SH, Lin JW, et al. Curcumin enhances neuronal survival in N-methyl-d-aspartic acid toxicity by inducing RANTES expression in astrocytes via PI-3K and MAPK signaling pathways. Prog Neuropsychopharmacol Biol Psychiatry 2011;35:931-8.
von Bohlen und Halbach O, Dermietzel R. Neurotransmitters and Neuromodulators. Weinheim, Germany: Wiley-VCH; 2002. p. 41. Zhang Y, Shoyama Y, Sugiura M, Saito H. Effects of Crocus sativus L. on the ethanol-induced impairment of passive avoidance performances in mice. Biol Pharm Bull 1994;17:217-21. Dev S. A Selective of Prime Ayurvedic Plant Drugs (Ancient- Modern Concordance) Anamaya Publication, 2006. p. 100-102. Dhanasekaran M, Holcomb LA, Hitt AR, Tharakan B, Porter JW, Young KA. et al, Centella asiatica extract selectively decreases amyloid beta levels in hippocampus of Alzheimer's disease animal model. Phytother Res 2009;23;14-9. Kim SR, Hwang SY, Jang YP, Park MJ, Markelonis GJ, Oh TH, et al. Protopine from Corydalis ternata has anticholinesterase and antiamnesic activities. Planta Med 1999;65:218-21. Preeti K, Rawat MSM, Comparative nootropic effect of Evolvulusalsinoides and Convolvulus pluricaulis. International Journal of Pharma and Bio Sciences 2011;2:1-16. Ghosal S, Bhattacharya SK. 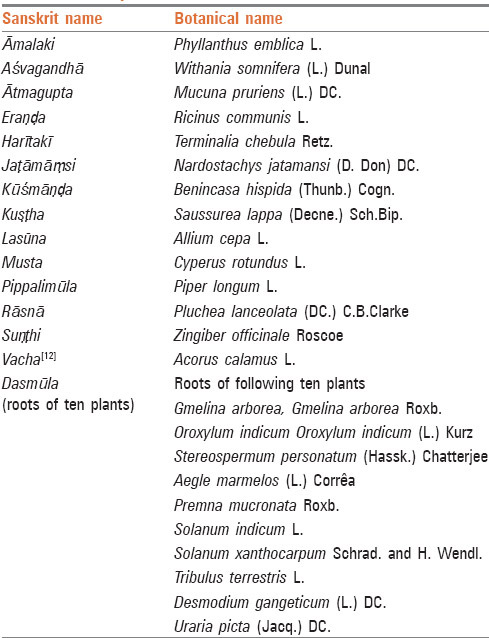 Desmodium alkaloids. II. Chemical and pharmacological evaluation of D. gangeticum. Planta Med 1972;22:434-40. Joshi H, Parle M. Antiamnesic effects of Desmodium gangeticum in mice. Yakugaku Zasshi 2006;126:795-804. Malik J, Karan M, Vasisht K. Nootropic, anxiolytic and CNS-depressant studies on different plant sources of shankhpushpi. Pharm Biol. 2011;49(12):1234-1242. Ganguly R, Guha D. Alteration of brain monoamines & EEG wave pattern in rat model of Alzheimer's disease & protection by Moringa oleifera. Indian J Med Res 2008;128:744-51. Ganguly R, Hazra R, Ray K, Guha D. Effect of Moringa oleiferain experimental model of Alzheimer's disease: Roleofantioxidants. Ann Neurosci 2005;12:36-9. Mohan M, Kaul N, Punekar A, Girnar R, Junnare P, Patil L. Nootropicactivity of Moringa oleifera leaves. J Nat Remedies 2005;5:59-62. Ghayur MN, Gilani AH, Ahmed T, Khalid A, Nawaz SA, Agbedahunsi JM, et al. Muscarinic, Ca(++) antagonist and specific butyrylcholinesterase inhibitory activity of dried ginger extract might explain its use in dementia. J Pharm Pharmacol 2008;60:1375-83. Obulesu M, Rao DM. Effect of plant extracts on Alzheimer's disease: An insight into therapeutic avenues. J Neurosci Rural Pract 2011;2:56-61. Handa SS, Kaul MK, editors. Supplementto Cultivation and Utilization of Medicinal Plants. Jammu-Tawi, India: Regional Research Laboratory, Council of Scientific & Industrial Research; 1996. p. 515. 38 Lodha R, Bagga A. Traditional Indian systems of medicine. Ann Acad Med Singapore 2000;29:37-41. Stough C, Lloyd J, Clarke J, Downey LA, Hutchison CW, Rodgers T, et al. The chronic effects of an extract of Bacopa monniera (Brahmi) on cognitive function in healthy human subjects. Psychopharmacology (Berl) 2001;156:481-4. Roodenrys S, Booth D, Bulzomi S, Phipps A, Micallef C, Smoker J. Chronic effects of Brahmi (Bacopa monnieri) on human memory. Neuropsychopharmacology 2002;27:279-81. Billore KV, Yelne MB, Dennis TJ, Chaudhari BG. Database on Medicinal Plants Used in Ayurveda. Vol I. New Delhi: Central Council for Research in Ayurveda and Siddha; 2004. Veerendra Kumar MH, Gupta YK. Effect of different extracts of Centella asiatica on cognition and markers of oxidative stress in rats. J Ethnopharmacol 2002;79:253-60. Singh HK, Rastogi RP, Sriman RC, Dhavan BN. Effect of Bacoside A and B on avoidanace response in rats. Phytother Res 1988;2:70-5. Stough C, Downey L, Lloyd J, Silber B, Redman S, Hutchison C, et al. Examining the nootropic effects of a special extract of Bacopamonniera on human cognitive functioning: 90 days double blind placebo controlled randomized trial. Phytother Res 2008;???:1-6. Singh HK, Dhawan BN. Neuropsychopharmacological effects of the Ayurvedic nootropic Bacopa monniera Linn. (Brahmi). Indian J Pharmacol 1997;29:359-65. Bhava Mishra, Chunekar KC, Commentator, Bhava Prakasha Nighantu, Guduchyadivarga 237, Revised and Enlarged edition. Varanasi: Chaukhambha Bharati Academy; 2010. Appa Rao MV, Srinivasan K, Rao TK. The effect of Mandookaparni (Centellaasiatica) on the general mental ability (Medhya) of mentally retarded children. J Res Indian Med 1973;8;9-16. Mook-Jung I, Shin JE, Yun SH, Huh K, Koh JY, Park HK, et al. Protective effects of asiaticoside derivatives against beta-amyloid neurotoxicity. J Neurosci Res 1999;58:417-25. Lee MK, Kim SR, Sung SH, Lim D, Kim H, Choi H, et al. Asiatic acid derivatives protect cultured cortical neurons from glutamate-induced excitotoxicity. Res Commun Mol Pathol Pharmacol 2000;108:75-86. Gupta YK, Veerendra Kumar MH, Srivastava AK. Effect of Centella asiatica on pentylenetetrazole-induced kindling, cognition and oxidative stress in rats. Pharmacol Biochem Behav 2003;74:579-85. Orhan IE. Centellaasiatica (L) Urban, From traditional medicine to modern medicine with neuroprotective potential, Evid Based Complement Alternat Med 2012;2012;1-8. Garg DS. Dhanwantari-Vanaushadhivishesh Anka. Vol.6. Vijaygard, Aligarh, India: Dhanvantari Karyalaya; 1971. p. 452. Park SY, Kim DS. Discovery of natural products from Curcuma longa that protect cells from beta-amyloid insult: A drug discovery effort against Alzheimer's disease. J Nat Prod 2002;65:1227-31. Rajakrishnan V, Viswanathan P, Rajasekharan KN, Menon VP. Neuroprotective role of curcumin from curcuma longa on ethanol-induced brain damage. Phytother Res 1999;13:571-4. Reddy DV, Nishteshwar K. Clinical evaluation of Rasayana effects of Charak's Vayasthapana Dashemani. Int J Res Ayurveda Pharm 2011;2:20-2. Howes MJ, Perry E. The role of phytochemicals in the treatment and prevention of dementia. Drugs Aging 2011 1;28:439-68. Nagle BT, Hitner H. Pharmacologyan Introduction. 5th ed.McGraw Hill; 2005. p. 76. 3 Antifungal and Anticancer Potential of Argemone mexicana L.